Pedestrian Safety Audit - TADI - Traffic Analysis & Design, INC. Pedestrian Safety Audit - TADI - Traffic Analysis & Design, INC.
TADI provided recommendations for both the short-term and long-term. 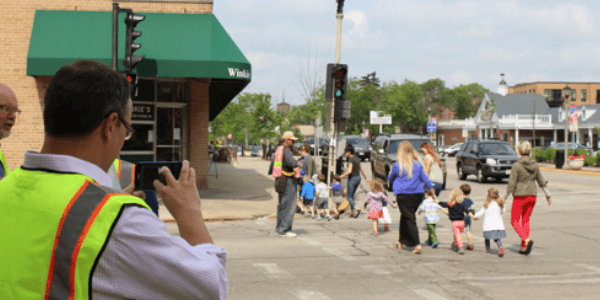 On the heels of a tragic pedestrian fatality, TADI was hired to conduct a pedestrian safety audit of the Silver Spring Drive corridor in Whitefish Bay. TADI led a walking audit that included the Village’s police chief, public works director, and public relations and business district representatives. The audit drew the attention of local news stations, three of which interviewed TADI staff. TADI provided recommendations for both the short-term and long-term. Short-term recommendations centered around using signing and pavement marking to increase pedestrian awareness. Long-term solutions included updating signals to include pedestrian countdown timers. The village council approved financing of the short-term recommendations TADI presented at the council meeting.